Convenient high quality vanilla flavour protein drink with carbohydrates for energy. Use as a second meal when required or as a post exercise drink. 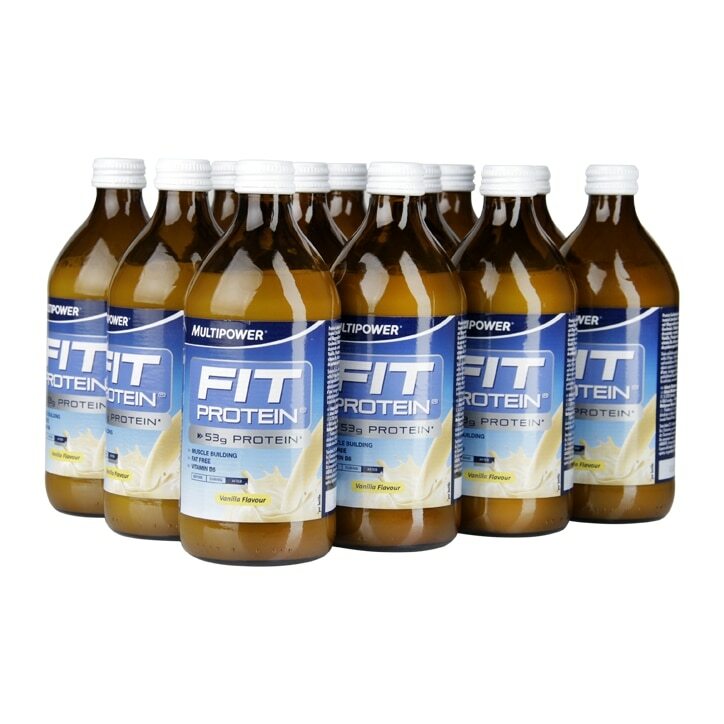 This protein filled drink is fat free and contains 53g of protein per bottle. Each drink is 500ml. Drink 1 bottle after training or when required. Vanilla flavour: Skimmed Milk Retentate (91%), Sucrose, Milk Protein (3%), Flavouring, Vitamin B6, Stabiliser: Carrageenan. Contains Lactose. Multipower Fit Protein Vanilla is rated 5.0 out of 5 by 6. Rated 5 out of 5 by SadiqR from 10/10 Great tasting and fast results. Doesn't leave a chemical aftertaste. Very high sugar content is the only catch but overall a great product. Rated 5 out of 5 by Wayne30s from Excellent ease of use I bought a bulk order of Fit Protein Multipower protein shakes. The ease and clarity when placing order was a big plus. Rated 5 out of 5 by CarlC from Great Tasting Love the vanilla flavour. It is not too over powering. Tastes great and have one bottle a day in between meals on days that I train. Rated 5 out of 5 by Fred24 from I have been looking for high protein drinks to buy cheaper than the gym I train at but tasted the same or better and found this drink ticked all the boxes the price was a head turner compared to the gyms price and I will be ordering frequently now.